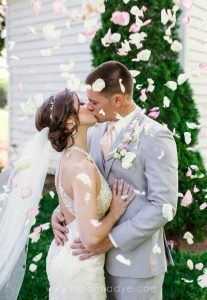 We so enjoyed hosting Paige and Tyler’s recent spring wedding at the Rand-Bryan House. With the help of a creative planner and valuable insight from Paige’s mom, Paige and Tyler planned a gorgeous ceremony that was executed beautifully with soft, romantic details. Paige and Tyler’s April wedding at the Rand-Bryan House was recently featured on Bustld! Check out their sweet southern spring wedding to see their dreamy color scheme and beautiful use of one of our outdoor ceremony sites. Read the full post on Bustld to learn more about Paige and Tyler’s story and the great team of vendors who helped them achieve the romantic southern vibe they envisioned!